The Short Version: Singles dating online have to be on the lookout for fake profiles and copy-and-pasted messages. Not everyone comes to dating websites with good intentions, and you definitely don’t want to get involved with a scammer. How can you know if someone you met online is the real deal? Look them up! You can use Copyscape to find out if daters have plagiarized any portion of their dating profiles or messages. Simply input the suspicious text, and the free plagiarism detector will highlight any copies on the web. For added protection, you can sign up for Copyscape Premium, an advanced plagiarism-search solution intended for content buyers and site owners to check up to 10,000 pages at once. Additionally, the Copysentry product protects you from plagiarism by automatically scanning the web and notifying you of any copies of your text floating around out there. If you’re single and looking for some peace of mind, Copyscape provides a wealth of resources and tools to give you greater confidence and security when flirting with daters online. Nothing in those messages indicates sincere interest. Most likely, the messenger is blanketing all dating prospects with the same message because it saves time and energy. Not a classy move, but pretty common. To date safely and successfully, you have to get good at spotting phonies, but that’s not easy when you’re online and only have someone’s words to go by. Vague or stilted language in a message or dating profile could mean that person is being disingenuous with you — or he or she could just be a poor writer. If you’re reading a profile that seems suspicious, you can run it by plagiarism experts to see if the text shows up anywhere else on the web. Copyscape offers easy online plagiarism detection to help you vet a date before making contact. Copyscape detects plagiarism using reliable online search tools and fast-acting notifications. You probably don’t need Copyscape to tell you a certain smooth talker doesn’t really think you have a great smile, but it can be useful for spotting fraudulent dating profiles. You can paste their profile language into Copyscape’s professional plagiarism detection tools to uncover fakers or players with just a click of a button. The site’s free and premium solutions empower daters to make sure they only talk to people with authentic profiles and genuine personalities. No more wasting time with plagiarists and scammers! Plagiarism Today recommends Copyscape to online daters, saying, “If you suspect a profile is fake, or just want to check and make sure the person messaging you is authentic, one of the easiest steps is to check and see if the content is original.” Daters can scan for plagiarism quickly and safely on Copyscape. 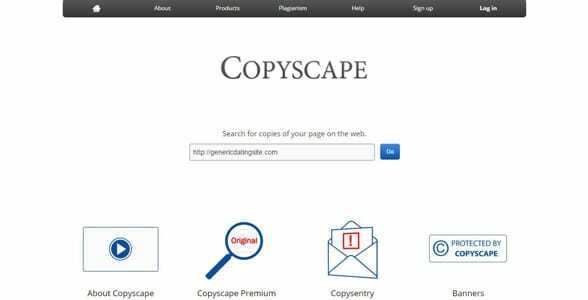 Copyscape’s free plagiarism detector helps you find out if specific webpages are authentic and trustworthy. Type in a suspect URL into the search box to find out if the language is unique or in use elsewhere on web. You can conduct up to 10 searches per month for free. You’ll see a summary of statistics, highlighted text, and a total word count to help you break down to what extent the site has been plagiarized. For safety-conscious online daters, Copyscape’s free tool comes in handy when selecting a dating site. With one click, you can find out if the site’s content is original or not. Sometimes a single site is connected to a larger network of dating websites all using the same basic text and user base. Some online dating conglomerates will create identical profiles for you on all their sister sites. With Copyscape, you can scope out the dating site before sharing your personal details. 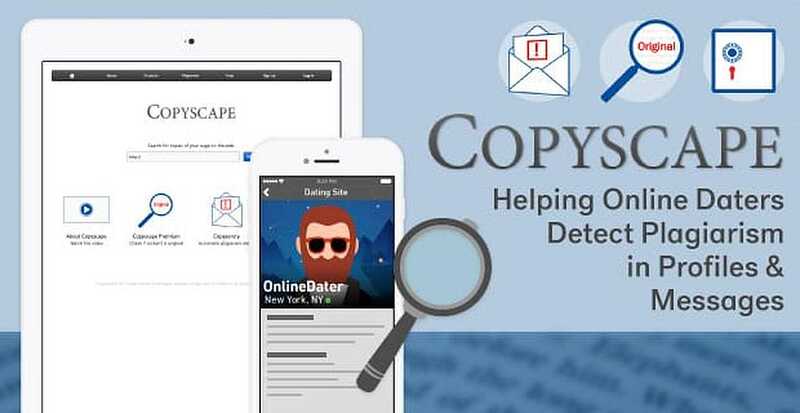 If you want to investigate two specific dating websites for similarities, Copyscape’s free comparison tool will clearly compare two webpages or articles. You can submit suspicious URLs or texts and then click “Compare Items” to see where they overlap. Copyscape points out matching language — it does not ascertain who the plagiarist is or even if intentional plagiarism occurred. It’s an unbiased and user-friendly comparison tool. Seeking more powerful protection from plagiarism? Then you can sign up for Copyscape Premium. Unlike the free tools, which have a cap on the number of searches you can make, this upgraded service provides unlimited plagiarism protection for anyone seeking online security. You can check up to 10,000 pages in one scan using the site’s Batch Search. Each search costs just five cents, so it’s an affordable option for individuals and businesses alike. With Copyscape Premium, you simply copy and paste suspicious text directly into the search box to find any copied versions on the web. This tool offers a streamlined search with many beneficial features. For instance, you can filter out sites you already know have copied your given text. The simple interface allows you to track multiple cases of plagiarism at once. For online daters, this tool means it’s easy to spot a fake. Someone duplicating dating profiles is definitely not someone you want to know, so make sure they pass Copyscape’s plagiarism test before getting attached. To protect yourself from this sly form of identity theft, you can enlist the help of Copysentry, a proactive plagiarism monitoring service. For less than $5 a month, this premium solution automatically scans the internet for copies of your content. Copysentry will email you if or when new copies of your profile appear elsewhere. You can set the number of copied words necessary to trigger an alert and choose sites to ignore, which is useful if you’ve created identical profiles elsewhere. Copysentry lets you manage multiple cases of plagiarism with one comprehensive scan. This copyright protection service is geared toward website owners but could also have applications for online daters looking for greater security and peace of mind. Sometimes it’s just nice to know your words are staying with you and not being usurped by someone with ill intents. 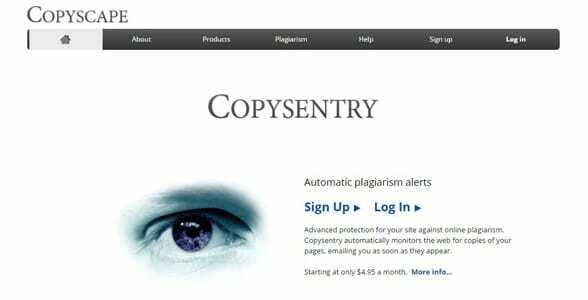 Should CopySentry flag a plagiarist site or user, you can look to its resources on how to prevent and respond to plagiarism for how to proceed. If the copied content belongs to you, you should send a cease-and-desist letter to the perpetrator to take back control of your content. Thanks to Copyscape, singles have a way to catch plagiarists and phonies on the web red-handed. Next time some “genuinely nice guy with a heart of gold” sends you a message, you don’t have to take his word for it. Instead, you can check the dating profile’s authenticity by running it through Copyscape’s quick and easy plagiarism search. Of course, this isn’t a catch-all solution, but it can weed out some scummy copycats. By using Copyscape’s reliable tools, online daters can protect themselves from plagiarism and date more securely. According to Plagiarism Today, “It’s an extra line of defense against people who seek to game online dating to their own ends.” Anyone being disingenuous in their dating profiles or messages better look out!